Tomorrow is the big party and I am freaking out about a million details I need to deal with. Good thing you guys won’t have to miss out- I have an awesome guest post for you today! Carla from Chocolate Moosey has become a great blogging buddy of mine, and it’s particularly fitting that she guest post here, because I met her initially through a guest post she did on another blog! Plus, Carla and I share a great love of desserts, which is pretty evident from posts of hers like these peanut butter nutella crinkles, these strawberry lemonade cupcakes and these chocolate chip cookie dough cheesecake bars. (Plus, you know you gotta love a blog with an entire cheesecake section!) Anyway, check out Carla’s blog, then scroll down for her awesome looking recipe! Big thank you to Miriam for asking me to guest post today! It took me awhile to figure out what I wanted to make, but with this heat, ice cream was the perfect choice. 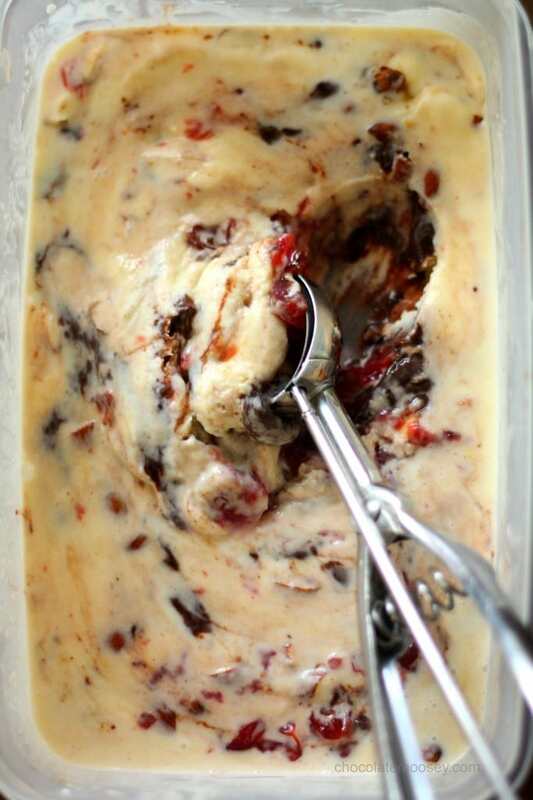 I’ve been dying to make this Dark Truffle, Candied Cherry and Toasted Almond Ice Cream from David Lebovitz’ book The Perfect Scoop ever since I got it. His picture is just so inviting with those vibrant red cherries. 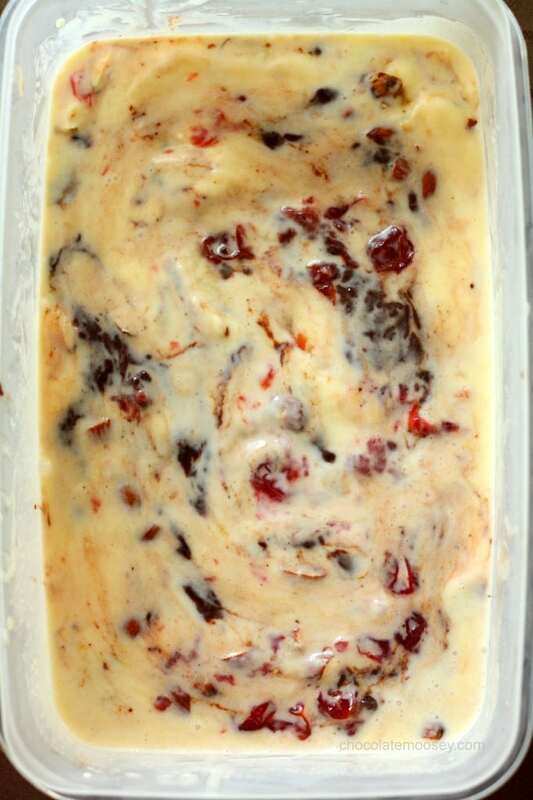 When I went cherry picking a few weeks ago, I knew I was making this ice cream. 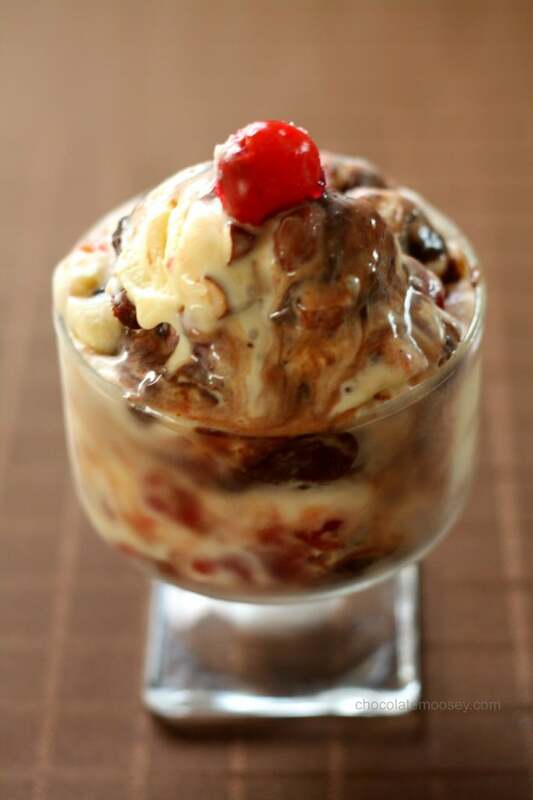 It is toasted almond ice cream packed full of candied cherries, more toasted almonds, and dark chocolate rum truffles. 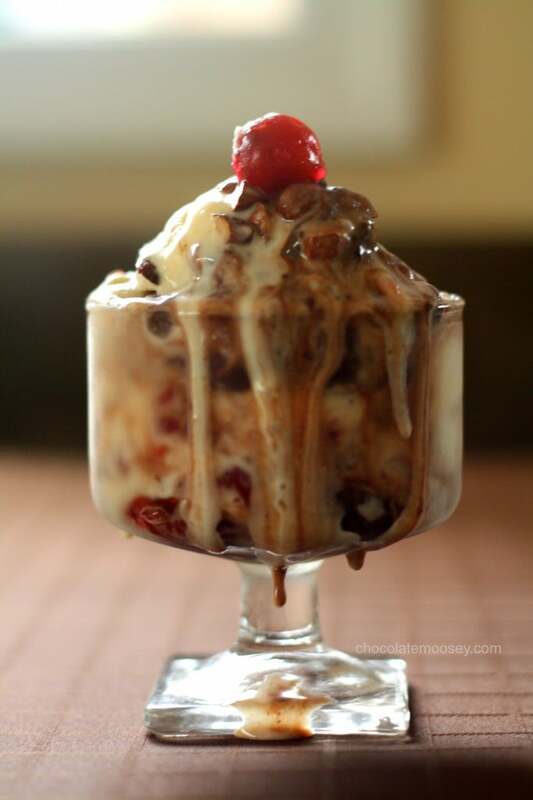 There is so much flavor in this Dark Truffle, Candied Cherry, and Toasted Almond Ice Cream that you won’t be able to contain your taste buds. The sweet candied cherries. The crunchy toasted almonds. The decadent dark chocolate rum truffles. All three flavors unite in a toasted almond ice cream base. I think I may like this combination more than chocolate ice cream. This ice cream may seem time consuming, but you can make the components ahead of time and multi-task the steps. First, you make the ice cream base and infuse toasted almonds. While that is infusing, you cook the cherries until a syrup forms. While that is cooking, you melt chocolate into heavy cream and freeze. It sounds like a lot of work, but honestly, all you’re doing is waiting. If you don’t have time to do it all in one day, break it into parts. One night I made the candied cherries and dark truffles. A few days later, I made the ice cream base, froze it, and added my mix-ins. I was a bit impatient in letting my ice cream freeze completely, so I had a bit of a melted mess on my hands when I took the pictures. Although the recipe appears time-consuming, steps 1-4 overlap in prep. The candied cherries, dark truffles, and toasted almonds can be made ahead of time. Make the candied cherries: In a medium saucepan, heat the cherries, water, sugar, and lemon juice until it starts to boil. Turn the heat down to low and cook for 25 minutes, stirring frequently during the last 10 minutes to ensure they are not sticking. Once the syrup is reduced to the consistency of maple syrup, remove from the heat and add the almond extract. Let the cherries cool in their syrup. After cool, drain the cherries in a strainer over a bowl for about 1 hour. 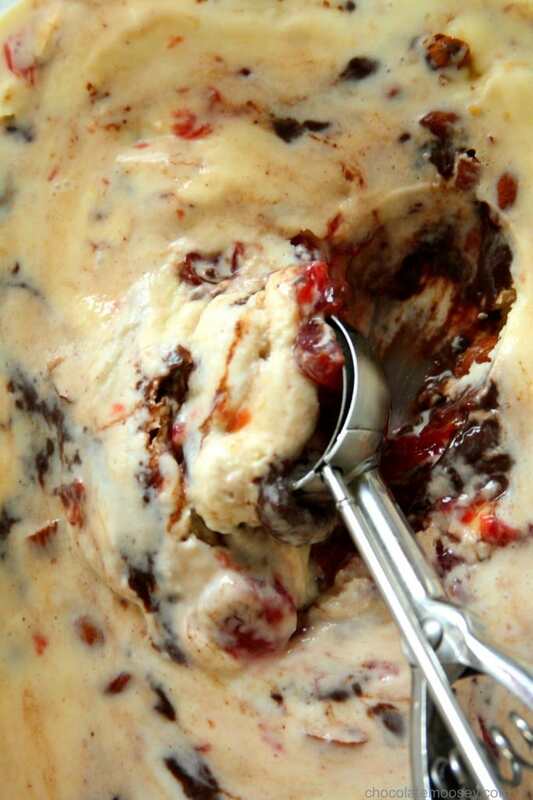 Reserve the candied cherries; save the syrup for another recipe (or serve with ice cream). Meanwhile, make the dark chocolate truffles: In a small saucepan, heat the cream until it just begins to boil. Remove from the heat and stir in the chocolate until melted and smooth. Mix in the rum. Place the chocolate mixture into a small bowl and freeze until firm, about an hour. Scoop into small balls and keep frozen. Meanwhile, toast the almonds: Preheat the oven to 350F. Place the almonds onto a cookie sheet and into the oven. Heat the almonds until toasted, stirring every 5 minutes or so (roughly 10-15 minutes). Remove from the heat and turn off the oven. Now infuse the ice cream base: In a medium saucepan, warm the milk, sugar, salt, and ½ cup cream. Add ½ cup toasted almonds (reserve the other half to stir in). Cover, remove from the heat, and let steep at room temperature for 1 hour. Strain the milk mixture into a separate medium saucepan; squeeze as much milk from the almonds. Discard the almonds. Rewarm the strained milk mixture. Pour remaining ½ cup cream into a large bowl and set a mesh strainer on top. Place the bowl in an ice bath. In a small bowl, whisk together the egg yolks and some of the warm milk mixture. Scrape the yolks back into the saucepan. Cook over medium heat until the mixture thickens and coats the back of your spoon. Remove from the heat and pour the mixture through the strainer into the reserved cream. Add almond extract and stir until cool. Chill the mixture in the refrigerator until cold then freeze according to your machine's directions. If freezing by hand, place the mixture in the freezer and whisk every 30-45 minutes or until almost frozen. During the last few minutes of churning/freezing, stir in the remaining toasted almonds, candied cherries, and dark truffles. WoW. That looks so good it makes me hungry just looking at it. Enjoy your Sheva Brachos. It will be an amazing success. Oh my. Looks FANTABULOUSLY delicious. Love the candied cherries! YUM! So great you invented a word LOL Thanks Jen! 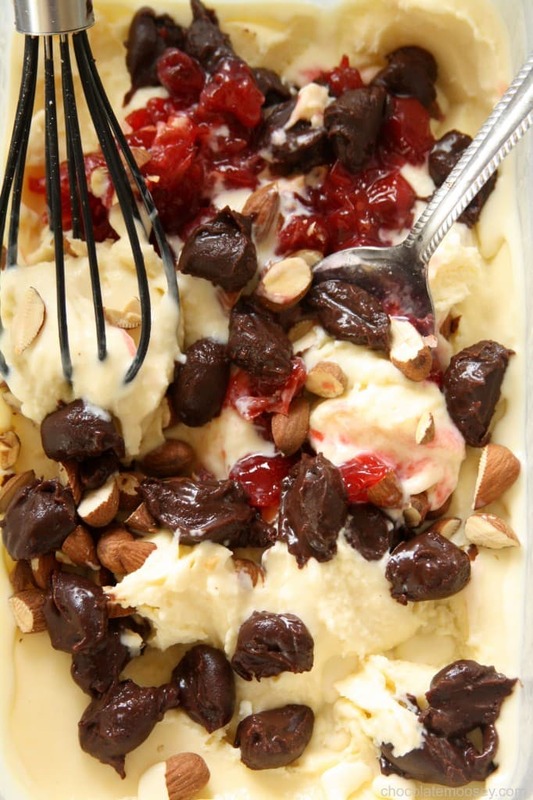 That looks absolutely incredible and ridiculously tempting… I think maybe this would be my favourite ever ice cream if I tried it… Cherries are my favourite fruit at the moment and they go so well with almonds. 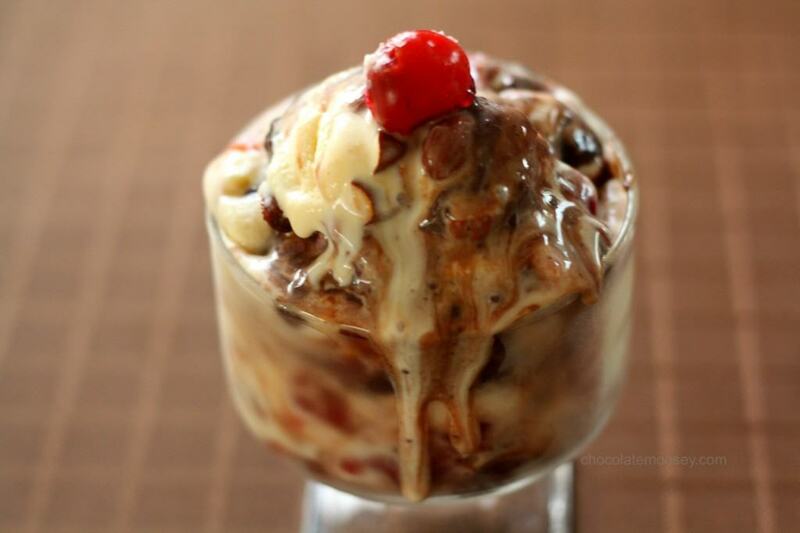 Gotta admit I like this better than chocolate ice cream (gasp!) I could eat a whole bowl of the candied cherries alone. Thanks! I don’t have an ice cream maker either so I must check out David’s post. Your ice cream does look delicious. (say the chocolate and cherry lover 🙂 Great guest post Carla. I’ve been using his method for a few years now. The hardest part is remembering to whisk it every 30-45 minutes when it is freezing. If you do forget, it’s not the end of the ice cream – it just won’t be as smooth (but really it’s still fine to eat!) Thanks Paula! This ice cream is fantastic! The toasted almonds sound incredible paired with the other two already-perfect- together flavors!